This is probably a boring post but I’ve been meaning to do it, so there. I grew up ‘neath the shade of a fine example of the ancient plant genus known as Magnolia, part of a family of plants believed to be over 95 million years old. 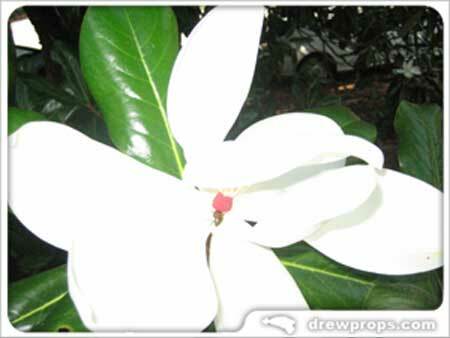 Our magnolia belonged to the subgenus Magnolia grandiflora, better known as the “Southern magnolia”, star of stage, screen and stereotype of the Mint-Julep-sipping American South. Paleobotanists say that the magnolia family has outlasted mountain ranges, ice ages and continental drift, finding itself spread around the world in the process, from Asia to the Americas. Back in its prime this tree was undoubtedly the favorite food of more than a few kinds of dinosaur, an electrifying concept. Its limbs, its leaves, its fruit, its very essence is imbued with a peculiar, tart odor. I imagine it to be the primal scent of Dinosaurtown.